Well duh, right? 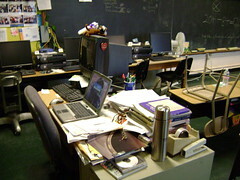 My dog of a "teacher workstation" is now gone, replaced by a laptop. This was no easy thing to accomplish, and very few teachers where I teach are able to move away from these hopelessly outdated and underpowered beasts. They are, BTW, the only machines on which teachers are allowed to bypass the filter. Two days ago I uploaded pictures to Flickr on it. I posted a blog article on that laptop. From my teacher desk, for the very first time. My kids have been web 2.0 for a long time from our classroom. It's fun to finally be a part of it with them. I wish my colleagues could do the same. It is really interesting to see how your classroom is arranged. In the school I work at the teachers had a chance at the end of last year to choose laptops OR desktop machines for themselves and their students (4 student workstations per classroom). Second Grade, Fourth Grade and Fifth grade opted for mobile labs. Laptop carts for a grade level make so much sense to me. One class can use all 12 and the classrooms are situated very close to one another so that it is easy to share or to plug the cart into one location and send kids to get a computer whenever they need one. However, I have gotten a lot of complaints. 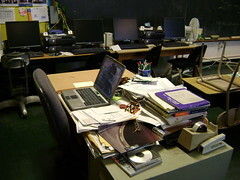 Some teachers are used to fixed assets and have a mind set that the laptops are a problem. Can you write about what you think of using laptops with K, 1 and 2 students? The teachers in my school don't think it is a good idea and would rather have desktops for them. Janice, laptop use is really tricky - so many variables involved. One thing that is rarely, in my experience, taken into account is the teaching style of teachers. If you're one of those linear types (I believe this fits most teachers), the arrival of a laptop cart for a few weeks means your schedule, routine, and environment - change. You work really hard to establish those things, and then you start all over. This is way easier to do with older kids. It can cause chaos with younger classrooms, and certainly requires a lot of extra work and effort on the part of the teacher. Then of couse when the cart goes away, the classroom goes through another big change. It's not like teaching a "unit", either, as the computers are just tools. I know people have had success with carts, but it sure has not happened where I teach. You've made huge leaps this year not only for your students but for your school and district as well. It have been fun reading about the transition that is taking place in your classroom...a transition that I hope the rest of your school district is watching, reviewing, and preparing for. Keep us the amazing work!